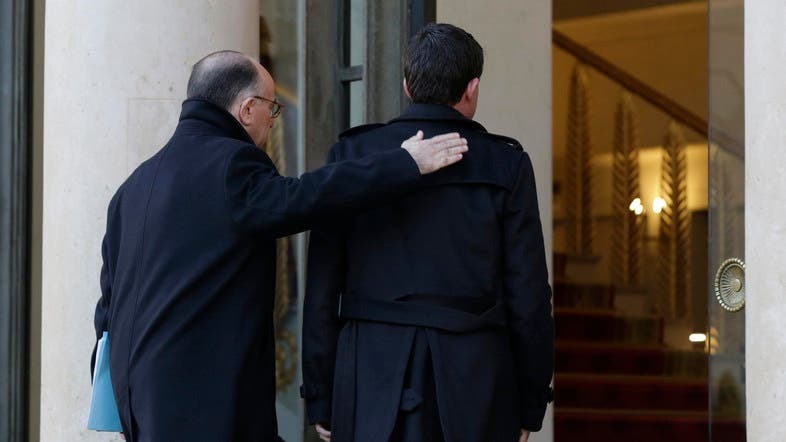 French Interior Minister Bernard Cazeneuve (L) places his hand on the shoulder of Prime Minister Manuel Valls as they arrive for a meeting at the Elysee Palace in Paris January 11, 2015. Interior ministers from a range of nations gathered in Paris Sunday called for an “essential” cooperation from Internet companies to tackle terrorism. EU and U.S. security ministers met at France’s interior ministry on Sunday to work out a joint response to the threat of jihadist attacks following days of carnage in Paris by three gunmen claiming to act on behalf of Al-Qaeda and the Islamic State group. The gathering was being held just hours ahead of a massive public rally in Paris against terrorism that was to be attended by dozens of world leaders. Ahead of the meeting, Spain’s Interior Minister Jorge Fernandez Diaz told the daily El Pais that his country wants to see the Schengen treaty modified to allow border controls to be restored to limit the movements of Islamic fighters returning to Europe from the Middle East. “The existing mobility in the European Union is facilitating the movements (of jihadists) to any country and also to our country,” he added. The March 1995 Schengen agreement removed passport checks on the EU’s internal borders. A total 26 European nations currently have signed the Schengen agreement, 22 of them EU members. Charlie Hebdo attack: A turning point for Islamophobia in France?